Healing Our Community Collaborative (HOCC) Women invites you to join “HOCC with Pride for all Women” on Monday, September 10, starting at 12pm at Old South Church, 645 Boylston St, Boston, MA. 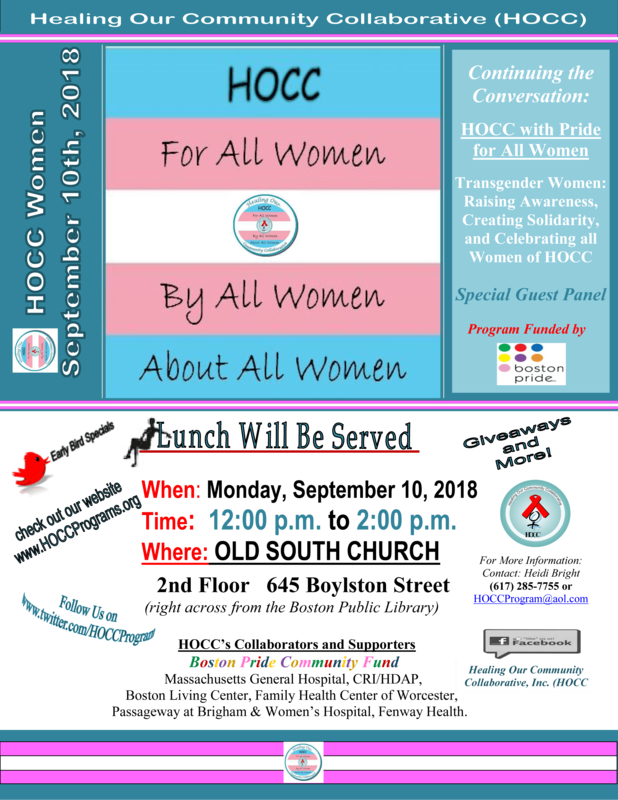 Lunch will be served and a special guest panel will focus on the topic: Transgender women – raising awareness, creating solidarity, and celebrating all women of HOCC. This event is sponsored by Boston Pride and the Boston Pride Community Fund, Massachusetts General Hospital, CRI/HDAP, Boston Living Center, Family Health Center of Worcester, Passageway at Brigham & Women’s Hospital, and Fenway Health.